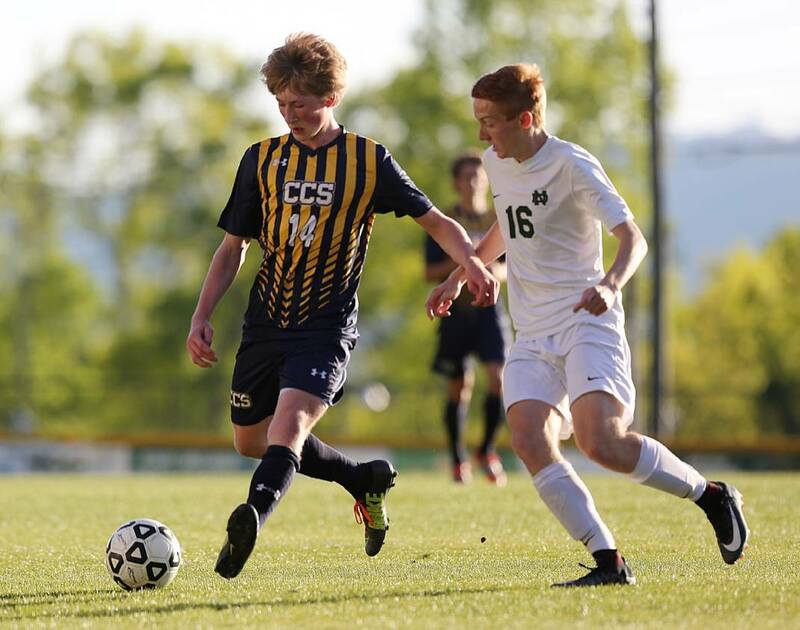 Chattanooga Christian School's Daniel Reinink (14) pushes the ball downfield while Notre Dame's Justin Hensley runs beside him during a match at Notre Dame in April 2018. Chattanooga Christian School is bringing Warren Smith back to his coaching roots. The school has named Smith, who worked there twice previously, head coach of its boys' soccer program. Smith taught and coached at CCS from 1987 to 1990 and again from 1997 to 2002, serving as an assistant when the Chargers won a state championship in 2001. "CCS is excited to see Warren return," athletic director Daniel Russell said. "He will help us build a soccer curriculum from fourth grade through 12th, which will enable us to build on the impressive foundation that already exists within our soccer program." Prior to Smith's 30 years of coaching experience at the high school, collegiate and professional levels, he played at Covenant College, where he was a team captain and ranked in the top 15 nationally in scoring. He also coached the GPS soccer program from 1991 to '95, earning Chattanooga-area coach of the year honors from the News-Free Press in 1991. "CCS and Chattanooga have always had a special place in my heart," said Smith, who has coached at Westminster Christian Academy in St. Louis since 2003. "It's where I started right out of college, and I still have strong relationships with so many there. "I've had friends texting me for the last few years asking when I was coming back. To be coming back home to those relationships is really exciting. We're hoping to continue that trend and have special times again there."